Chords!, previously known as Easy Chords is a plug-in for Winamp (one of the most used multimedia players on the market), that allows you to see guitar tabs in real time for any song that is being played with the program. Thanks to Chords! any person that is studying guitar will be able to play their favorite songs in the most simple way, because they will only have to install the plug-in and play the desired song from Winamp, and Chords! will automatically show the tab in a separate window. But this isn't all, to make this Winamp plug-in a lot more useful, the developers have also prepared it to recognize any piano or electric organ that sounds during a song and to show the corresponding score on the screen. Therefore, if you want to learn to play your favorite guitar or piano pieces, or you are simply interested in knowing the notes for any song, the easiest way of doing so is to download and install Chords!. This download requires that you have Winamp installed. The trial period is 15 days. 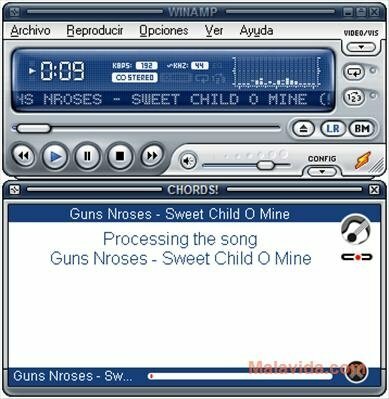 It may cause problems with some of the more modern Winamp interfaces, thus it is advisable to use it together with "Winamp Modern".